Use this universal enclosure to turn any 30mm (2230), 42mm (2242), 60mm (2260), or 80mm (2280) SATA M.2 NGFF SSD into an external USB 3.1 portable storage device. Slim enough for to fit in your pocket, the Bullet Proof enclosure adapter is great for cloning your existing drive to a new one or making use of your old drive after upgrading. Note: Optimum speeds will be had when plugged into a USB 3.0 / 3.1 port. This device it is also backwards compatible, meaning it can be used in USB 2.0 ports at USB 2.0 transfer rates. UAS is a computer protocol used to move data to and from USB storage devices. Systems that support UAS will see better results due to the capabilities listed below. 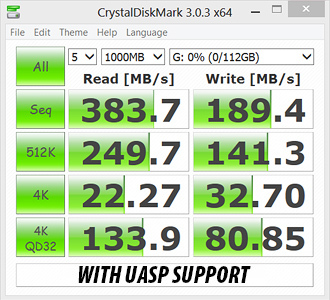 Without UAS, USB 3.0 R/W speeds will still reach 190/160. Maximizes bus utilization through the use of streams in USB 3.0.